One of the interesting things about teeth is that they’re all shaped differently. 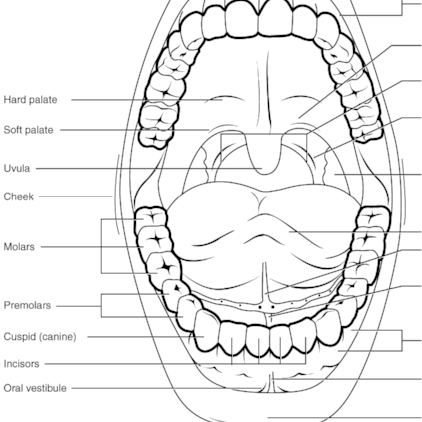 Each tooth has a special job, and their function depends on where they’re located in the in the mouth. Each tooth shape makes it ideal for the job it does. Here are those teeth and their jobs. Your incisors chop and cut food. When you bite into an apple, these are the first ones into it. There are eight permanent incisors--four on the top and four on the bottom. These are also the first teeth babies get. Tear These are the ones people tend to use for opening things when they use their teeth. They are sometimes called ‘eyeteeth’ because they are the teeth below the eyes. Practitioners of Chinese Medicine have historically believed there is an energy between the teeth and eyes. These are the teeth directly behind the canines, which both tear and crush food. There are eight of these, two on each side, top and bottom. These are the crushing machines in your mouth. Regardless of what you eat, it will eventually work its way back to these powerful teeth to be ground into small, easy to swallow bits. If you notice, they aren’t flat; each one has four diamond points with grooves in between. That’s because if they were flat, they would mash the food flat (like a rolling pin) instead of crushing it. 100 years ago, Dr. G. E. Black, president of the Chicago Dental University, developed a device which could measure the amount of force produced by the human jaw. What he discovered was that it’s the teeth, rather than the jaw, which determines the upper end of the strength of a person’s bite, because the teeth (even healthy ones!) start to hurt long before the jaw runs out of strength. The measurements ranged from 45-270 pounds. Why did he want to know? Well, that’s a tough nut to crack, isn’t it? Oh, wait--what is that dangly thing? Oh, yes, it's a uvula. That punching-bag looking thing in the back of your throat is the palatine uvula. The newest studies say it creates saliva, and since the average person creates enough saliva in their lifetime to fill about two swimming pools, it must be working. Saliva makes your food easier to chew and also it washes away the sugars from your teeth. There is still speculation that it may have something to do with crib deaths, but we just don’t know. Some people have it removed to prevent sleep apnea. Now that you know all of the functions of your teeth, a word of caution: these are excellent tools for tearing open wrappers, nipping off an extra bit of fingernail, and lifting the reluctant lid off of plastic jars, however, cosmetic dental bonding, or the process of repairing a chipped or cracked tooth, runs between $100-1000 and is often not covered by insurance. Do yourself a favor: buy a decent pair of nail trimmers and a high-quality bottle opener, and save the other $80-980.